Casual and contemporary, this dining set is designed for smaller dining spaces. 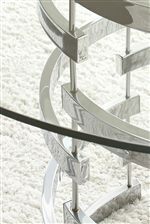 The table is a unique combination of a round tempered glass top and chrome plated metal pedestal base. 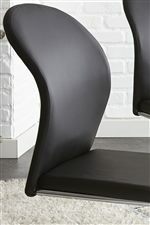 The black faux leather seats provide contrast to the chrome plated bases of both the table and chairs. The chairs feature a breuer base that makes it easy to move them across a floor. The Tayside 5 Piece Round Glass Table Set with Chrome Pedestal by Steve Silver at Walker's Furniture in the Spokane, Kennewick, Tri-Cities, Wenatchee, Coeur D’Alene, Yakima, Walla Walla, Umatilla, Moses Lake area. Product availability may vary. Contact us for the most current availability on this product.